Hope's Cafe: Oral-B Floss Face App News and #GIveaway! Hey, have you heard about the new Oral-B Floss Face App? That's right, an app called Floss Face! It's an app that celebrates flossing, in strange places or circumstances, or just your everyday flossing routine! Users can upload pictures of themselves flossing, to the Floss Face app on Facebook, and this enters them in a great giveaway-every 2 weeks, one flossing fanatic will receive an iPad or Tablet! And, first-time entrants will receive a tote bag with some Oral-B Glide products (up to the first 5,000 entrants)! 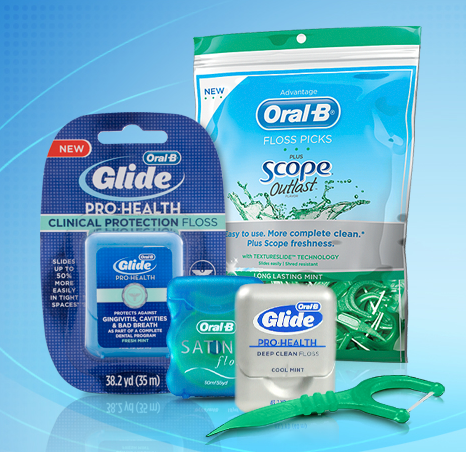 One of my readers will receive an Oral-B Glide Prize Pack!! Floss and brush after each meal. I visit dentist twice a year, brush, floss and rinse with mouthwash each day. I brush twice daily and floss a few times each week and I visit the dentist twice a year. Brush and floss daily. Mouth wash when I remember. I floss and brush my teeth twice a day and go to the dentist once a year. I brush at least twice a day and floss regularly. See the dentist about once per year. I brush 2x/day for 2 minutes, floss 3-4 times a week. I brush and floss daily twice. I also wear a mouth guard on my upper and lower teeth and I see the dentist for 6 month check ups. Brush, floss at least twice per day and religiously see the dentist every six months for a professional cleaning. I Brush with Crest with scope and floss twice a day. I brush morning and night and floss at night. brush in the morning and evening. floss every other day or so. Mouthwash every other day or so. I visit the dentist 2x a year, brush, use mouthwash and floss. Thanks!